On the eighth floor of a Greenwich Street apartment building in Tribeca lives a very large, very industrious family. You may have run across some of them hard at work in a local park, or seen them taking off for chores at home. Sunrise to sunset, their job is never done. “When they say busy as a bee, they’re not kidding,” said Wendy Chapman, whose family provides the hive for an estimated 60,000 Italian honeybees in a corner of their roomy terrace. This is the third season that the Chapmans have hosted bees, and they have been generously rewarded not only with plenty of fresh honey but with a front row seat on their colony’s fascinating, perfectly organized society. Throughout the day the bees make countless round-trips between Downtown greenery and their wooden hive. From nectar and pollen collecting duties to life-sustaining honey making and 24/7 care for their queen (she can do nothing for herself but lay eggs), the work ethic and communal spirit of the honeybee is inspiring. 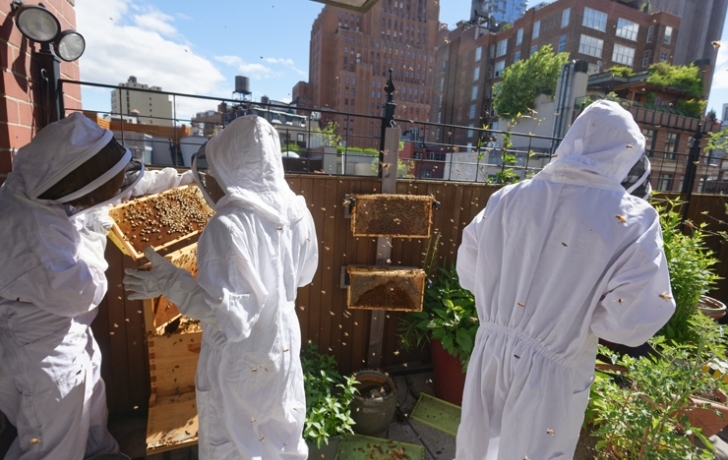 As required of those with terrace or rooftop hives, she registered hers with the city’s Health Department to become one of an estimated 500 beekeepers in the city. Chapman said neighbors haven’t complained and friends still come over for potluck suppers on the terrace, dining in sight of the hive. Every three weeks or so, the family opens the hive to check on the queen and clean out excess wax. (See photos below.) But the rest of the time, the fun they say is to just sit back and watch them work. “It’s a little more constructive than an aquarium,” West added. The Trib visited the Chapman family last month during one of their hive inspections.